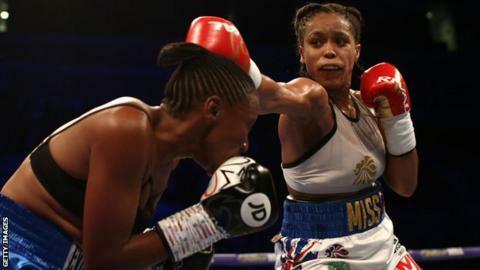 Former WBA super-featherweight champion Natasha Jonas bounced back from her first professional defeat with a win against Tanzania's Feriche Mashauri in her home city of Liverpool. The 34-year-old has been out of action since she was stopped inside four rounds by Viviane Obenauf in August. The referee awarded Jonas the fight by 60 points to 54 after six rounds. The lightweight admitted after the fight that she had been "rusty" going into the bout after eight months out. Jonas, who has now won seven fights since turning professional in 2017, became the first female British boxer to compete in the Olympics in her home Games in London in 2012. She says she may look for a rematch with Brazil's Obenauf to try to regain the title. "We've got a route now that we've got to go - and if she's on the route we'll look to get our revenge," Jonas told Sky Sports. Jonas was fighting on the undercard at the M&S Bank Arena in Liverpool as Liam Smith took on Sam Eggington. But the biggest talking point of the night came when heavyweight David Price was handed a win after rival Kash Ali bit him five rounds into their domestic bout.